Four months of violence and an attempted coup have resulted in a tragic loss of life and have taken a huge economic, social and psychological tool on Nicaragua. As the country starts to rebuild and repair the damage done, US aggression has increased, putting at risk all efforts to achieve peace, justice and reconciliation. At the same time, the right wing led opposition, unable to win power at the ballot box, continues to spread fake news on social media and to engage in widespread acts of violence designed to instil fear among the population and provoke further instability and sabotage efforts to build peace and reconciliation. National and international corporate media continues to espouse the opposition narrative and to fan the flames of conflict by publishing heavily biased and wildly inaccurate reports blatantly siding with Nicaragua’s opposition. 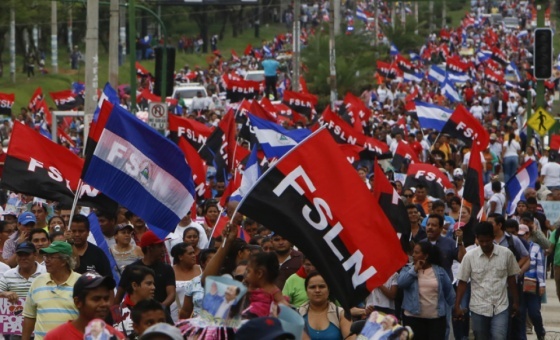 Tens of thousands of Nicaraguans have taken to the streets in support of the Government and calling for peace and it is the Nicaraguan people themselves who must be allowed to determine their own future, free from US and foreign aggression and interference.